Juan has been a thief for many, many years; for so long that he can’t remember what it’s like to work alongside someone, to have a conversation with someone, to share a home cooked meal with someone, to be out in the sunshine with someone. He’s even forgotten how to laugh. One day—a day that will begin to change his life—he crouches at the window of an old woman who has a coin in her hand. “I must be the richest woman in the world,” she says to herself, and Juan decides to steal her wealth. As he follows Doña Josepha around the countryside, Juan learns of the kindness and generosity of this curandera, and he meets many people she has helped. And when the thief finally does catch up with her, he finds that he has been changed as well, both physically and emotionally. 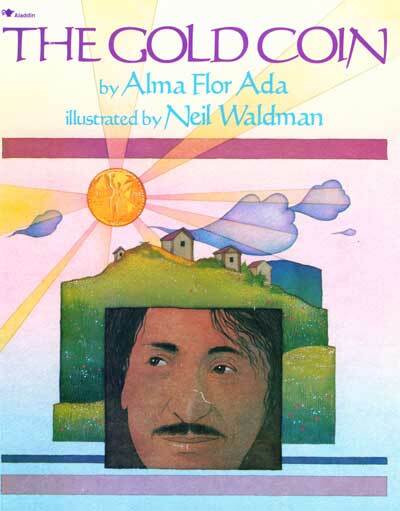 The Gold Coin is a beautiful story of generosity and reciprocity that youngsters will want to hear over and over. In Waldman's art nouveau-style watercolors, the forms sit on varying backgrounds of mostly pale blues and pinks, each page tinted in a rainbow wash, with land and people that only hint at somewhere in Central America as the location. I don't particularly like this art style, which I see as diminishing what is unique about particular lands and peoples. But the story itself is highly recommended.